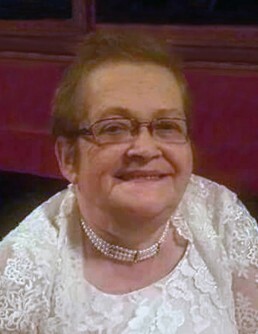 Alice “Ginny” Genevieve Crosslan Strege, 68, of Ellison Bay, fell asleep in the loving arms of husband, Daniel, at home and awoke in the arms of the Lord, Tuesday night, August 21, 2018. She was born October 12, 1949 in Midland, MI, the daughter of Robert Leonard Harcourt, Sr. and Helen Florence (TeWill) Harcourt. Ginny attended school in Michigan. She married Melvin Harold Crosslan in lower Michigan in January of 1969. Melvin passed away in 2005. Ginny lived in lower Michigan, then in the upper peninsula, and then in Wisconsin, most recently in Door County. She worked for Emerson Motors in Menominee, MI and also in Sturgeon Bay. Ginny worked at various restaurants over the years – Bemis in Crivitz, Pelletier’s in Fish Creek, and Rudy’s Café in Brillion, just to name a few, and also at Door County Confectionary in Fish Creek. She cared for others – her family earlier in life and then others (as a personal caregiver) later on. Ginny met Daniel John Strege through her daughter, Marsha, over ten years ago. Both of them were the youngest of their large families. They were united in marriage on October 12, 2017 at Ellison Bay Bluff. Ginny was an amazing baker and cook. Her Christmas cookies and jam were family favorites. Ginny enjoyed reading and birdwatching. She also liked traveling and shopping. Above all, Ginny loved visiting family and spoiling her grandkids. Her love will live on in the hearts of her husband, Dan (and his dog, Gidget); children, Marsha (friend, Bob) Swenson of Sturgeon Bay, Melvin (Noel) Crosslan of Two Rivers, Helen (Richard) Brown of Saint Nazianz, Randy (Angie) Walker of Florida. Heather (Zach) Moore of Ellison Bay, Jennifer (Wes) Collins of Carlsville, and Amber Strege of Ellison Bay; special “daughter” Brenda Adams of Green Bay; grandchildren, Jordan, Madison, Keegan, and Landon, Nicholas and Justin, Collin, Cassidy, and Charlie, and Cynthia, Isaac, Atlee, Brennan, Zain, and Danielle; siblings, William (Lois) Harcourt of Sebewaing, MI, Arthur Harcourt of Florida, Becky Harcourt of Bad Axe, MI, Robert Harcourt, Jr., and Kelly Harcourt of Bad Axe, MI; siblings-in-law, Harold “Hal” (Dolores “Loree”) Strege of Texas; Jim (Marlene) Strege of Buffalo, MN, Patricia Rowell of Racine, and Lucy Bruser of Colorado; special friends, Gloria Smith of Wausaukee and Sally Murphy (Alice’s maid of honor) of Ellison Bay; and other relatives; and friends. Ginny was preceded in death by her parents; first husband; granddaughter, Chayse Eryn Crosslan; siblings, Thelma (Clyde) Meloling, Edward (June) Harcourt, Patricia (Tony) Martinez, Roberta Harcourt, Melvin (Ann) Harcourt; and brother-in-law, Tom Strege. Her life will be honored with a memorial service held at 12:30 p.m. on Wednesday, August 29, 2018 at Huehns Funeral Home in Sturgeon Bay with Pastor Joel Rose, of Bethel Baptist Church in Ellison Bay, officiating. Visitation for family and friends will be held at the funeral home on Wednesday, August 29, 2018 from 11:00 a.m. until the time of service. A continued time of fellowship will follow at the funeral home after the service. In lieu of flowers, memorials may be given in her memory for Unity Hospice; or Edwards Lifesciences Corporation (newheartvalve.com) to support heart valve research and availability. A heartfelt thanks goes out to the staff of Unity Hospice, especially Cynthia Meyer and Jamie Keller for their wonderful, compassionate care given to Ginny. Expressions of sympathy, memories, and photos of Ginny may be shared with her family through her tribute page at www.huehnsfuneralhome.com.